Join Clare Brown at the 2016 SEGD Exhibitions & Experiences event in Washington DC August 18 and 19! 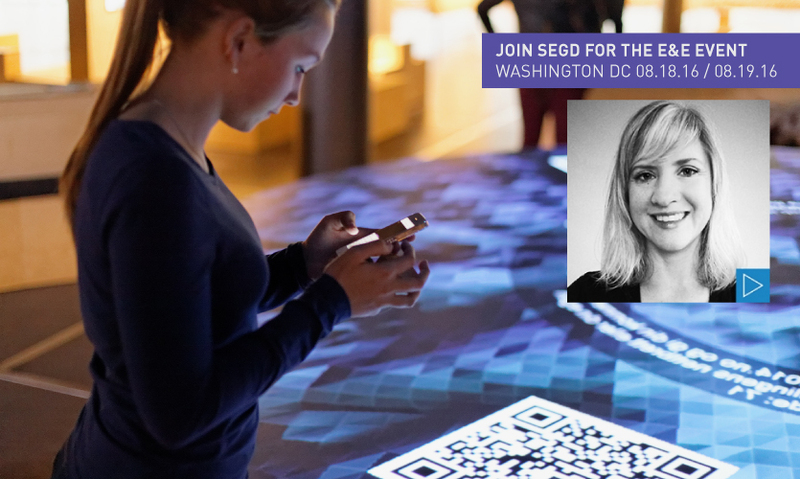 Join an engaging educational and inspirational dialogue with SEGD on Exhibitions & Experiences in the museum and beyond, in Washington, DC August 18-19 at the 2016 E&E Event. Nastya Lobova and Joe Karadin of ESI Design and Clare Brown, Chair of the MA Exhibition Design Program at The Corcoran School of the Arts & Design at GWU will lead a thought-provoking session on how the next generation of experience designers are embracing technology, storytelling and designing experiences that respond to algorithmic and user-generated content and how studios, institutions and museums are effectively designing for this kind of user and responding to the types of experiences that might be appealing to them. Brown, an exhibition and graphic designer with 15 years of museum experience, sees students striving to make exhibition design about a fully conceptual experience for the visitor. "That might mean creating transmedia experiences," Brown says, "for visitors who are used to engaging with information from multiple sources." Brown doesn't think media is the only answer to successful audience engagement. "Creating an experience is about conveying ideas, evoking emotions, and promoting dialogue among visitors. Everything is an experience" she says, "but sometimes the result is accidental. I would like to see it be intentional by design. That requires understanding of human behaviors. It's important to put the user first and really understand who you are designing for. Take any traditional design skill combined with an understanding of people and you are more likely to create an experience for them, rather than a display." People who are doing experience design are out in front of the big issue of how to engage the visitor—what Brown says is perhaps the biggest issue museums wrestle with. She suggests success may lie in re-imagining the design process. "We are still using old systems to design, where roles are quite compartmentalized, and the creative process is not built into the system. What if instead, exhibits could be designed more like apps? All the traditional roles of the creative process will still exist. But they'll be mashed-up differently, with a different project management sequence. Everyone will still hold their role, but the process will allow for more creative iteration, resulting in a more meaningful experience for the visitor." Don't just think about it, be a part of it! In addition to focused sessions, the 2016 SEGD Exhibitions & Experiences event (E&E) agenda includes tours, panel discussions, networking, and an experiential scavenger hunt. E&E is SEGD's most popular standalone event—register today to save your seat!